A permit in respect of a captive breeding facility must, in addition to the compulsory conditions contemplated in subregulation (1), be subject to a condition that no lions (Panthera leo) or leopards (Panthera pardus) originating from wild populations may be introduced in a captive breeding facility. (b)	may not perform artificial insemination, or allow the procedure to be performed, in the sanctuary. Sanctuaries are not allowed to breed. So if you see cubs and / or cub-petting is allowed, the facility is not a sanctuary at all, but a lion farm passing itself off to the public as a sanctuary. 48 (2)	The issuing authority must refuse to register a game farm for listed threatened or protected species that are not included on the certificate of adequate enclosure issued by the provincial issuing authority. (h)	Cape fox (Vulpes chama). In order to hunt TOPS animals the game (hunting) farm must be securely fenced for all species. Notice that although hunting farms are not allowed to farm with wild dog, cheetah, leopard, Bat-eared fox etc, they may farm with lions. Logic??? (k)	by means of an aircraft, except for the tracking of such specimen over long ranges. (2)	In addition to the conditions contemplated in subregulation (1), the issuing authority must issue a permit authorising the hunt of a listed large predator, white rhinoceros (Ceratotherium simum simum), black rhinoceros (Diceros bicornis), Nile crocodile (Crocodylus niloticus) or African elephant (Loxodonta africana), subject to the condition that the holder thereof may not hunt the animal by means of or by the use of a bow and arrow. Notice the cruel exceptions made for bow hunters. Currently they can shoot any animal, even an elephant, with a bow and arrow. The proposed regulations would seek to prevent that (who is monitoring compliance?) yet they leave buffalo, eland and other large animals at the mercy of bow-hunters, even though everyone knows how much cruelty bow hunters cause. (3)	The issuing authority must refuse to issue a permit for the hunting of a listed large predator that has been released in an area adjacent to a captive holding facility for listed large predators. Sec 72 seeks to tackle the problem of canned hunting by placing some restrictions on what the hunter can do e.g. he may not shoot a lion in a ‘controlled environment’ i.e. a small enclosure where the lion cannot hunt prey for itself, or in a larger camp which is adjacent to the enclosure. Notice that there is no 24 month wilding rule in the new regulations; the Supreme Court of Appeal decided that the Minister for the Environment had no jurisdiction to impose that rule on the lion farmers because they were farmers, not involved in conservation. Anyhow, this is a theoretical issue, because S.A. conservation structures are too dysfunctional to monitor compliance with any regulations, so the lion farmers will ignore any inconvenient restrictions anyway. But they look pretty on paper. 1. The proposed TOPS regulations will allow the canned hunting industry to continue to flourish. c)	Sympathetic to the canned hunting fraternity; eg they allow bow hunting of lions and other large animals like buffalo to continue. d)	Of absolutely no value whatever in preserving biodiversity. 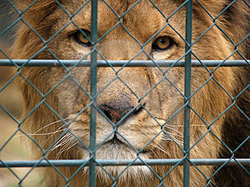 For the canned hunting industry, it is business as usual.